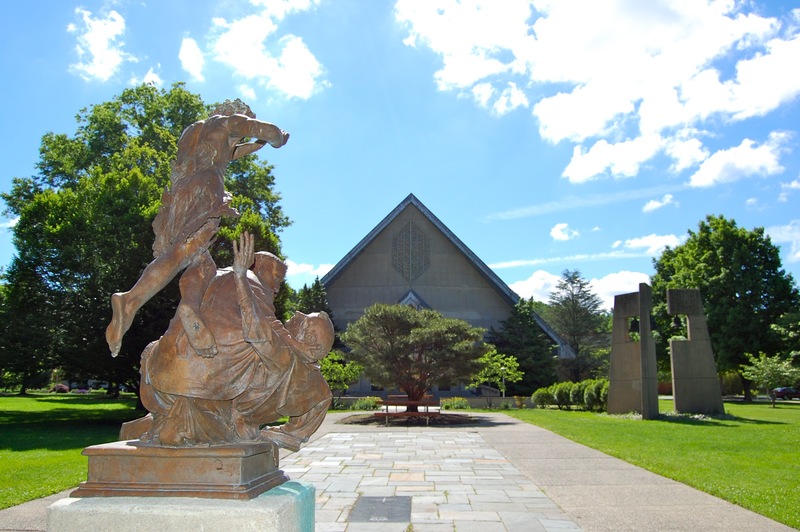 Daylesford Abbey, Paoli Pennsylvania, with bronze sculpture, the Abbey Church, and the bell tower on right. The bell tower consists of three bells that chime and resonate throughout the day. From any angle in looking at the bell tower, you see a cross. Detail: Bronze sculpture on Daylesford Abbey grounds. Blessed Hugh is the lower figure. 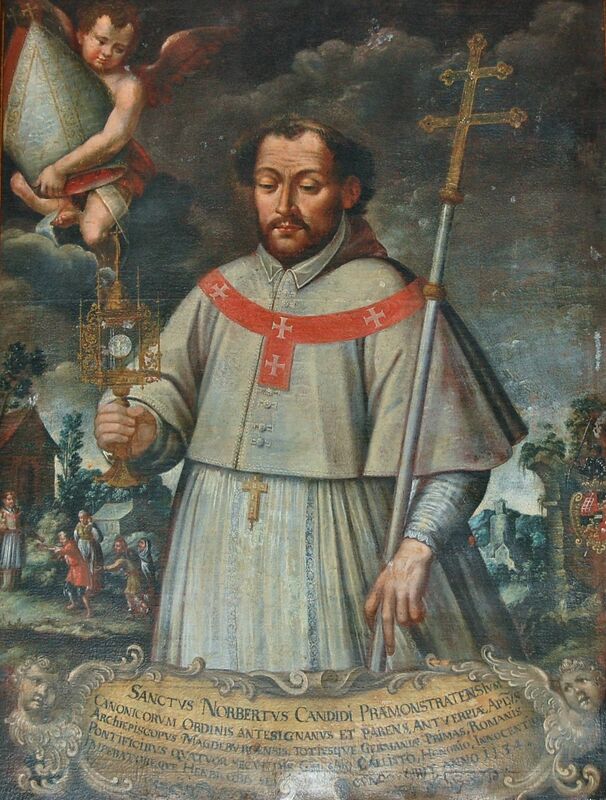 He was one of St. Norbert’s first disciples and later became first abbot of Prémontré. Above Hugh is Norbert, pointing upward to Jesus. And Jesus is the upright figure with hands raised to heaven. 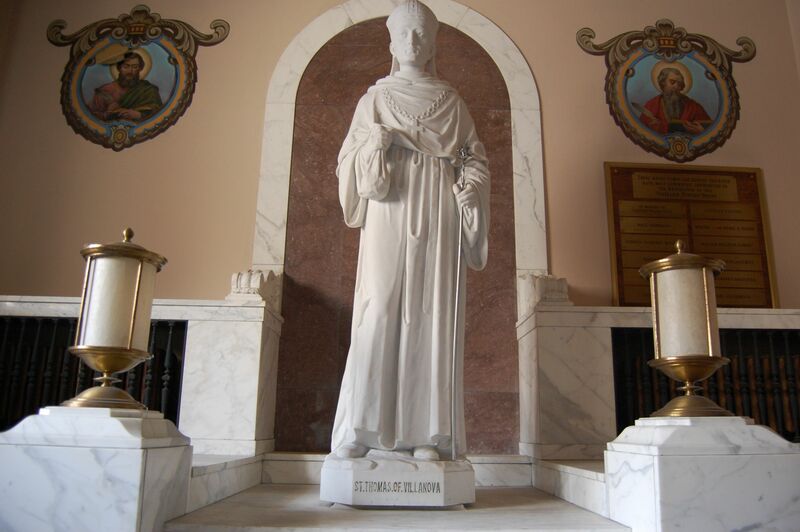 St. Norbert, founder of the Norbertine Order, at Daylesford Abbey in Paoli Pennsylvania, a suburb of Philadelphia. Norbert in his own side chapel at the Abbey. The light above is from a skylight opening. 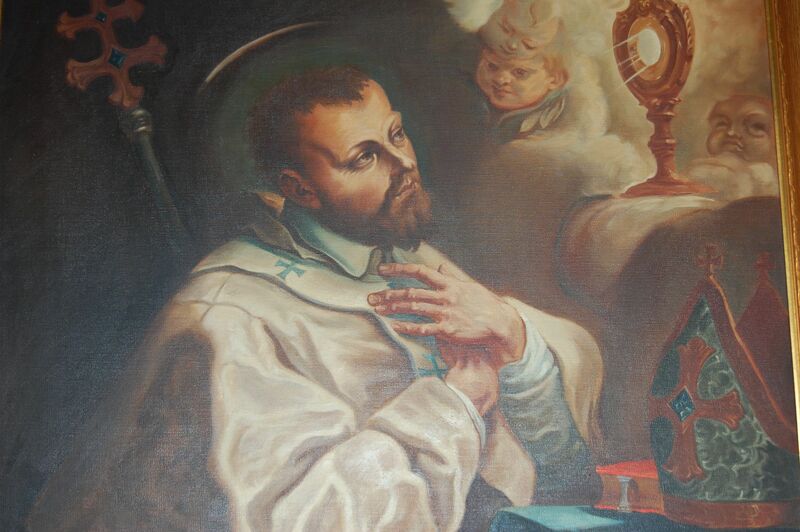 It’s June 6th, the feast day of St. Norbert. Detail of Norbert’s right hand holding the Monstrance with the Host embedded with the insignia JHS. The most common Christogram is “IHS” or “IHC”, denoting the first three letters of the Greek spelling of the name of Jesus. In Greek capitals Jesus name is ΙΗΣΟΥΣ or IHSOUS in Latin letters. Shortened this becomes IHS(ous) or IHS. 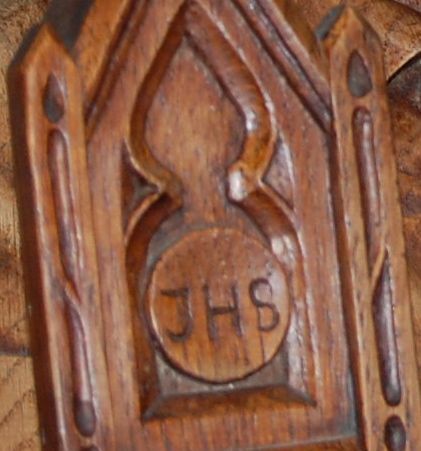 In Latin the I and J are interchangeable, therefore JHS is an equivalent meaning of the Holy Name. 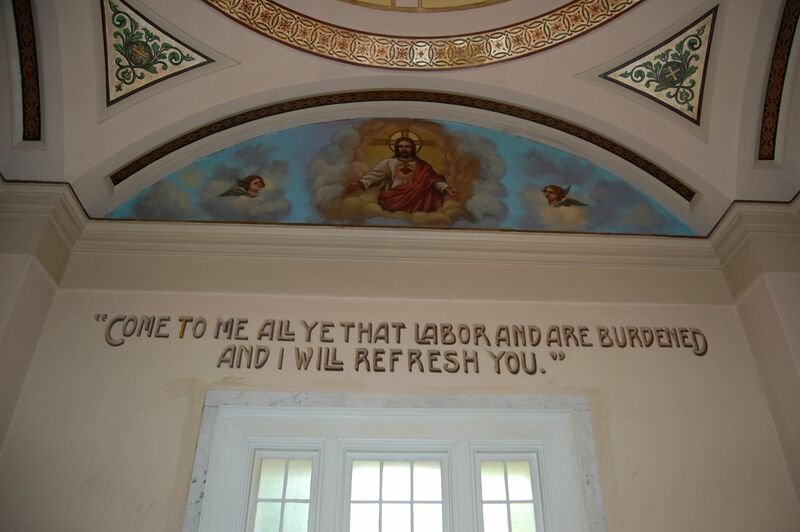 Norbert painting at Daylesford Abbey, Paoli Pennsylvania. Norbert in a state of ecstasy, receiving a vision from the Lord. On the right is his Archbishop mitre. On one occasion, while Norbert was celebrating Mass, a spider fell into the already consecrated chalice. To avoid desecrating the precious blood of Jesus, Norbert swallowed the large spider whole, only to have it expelled through his nose with a sneeze. Saint Norbert painting by Marten Pepijn 1637, oil on panel a O.L. Vrouwekathedraal Cathedral in Antwerp, Belgium. The Norbertines at Daylesford Abbey have a deep sense for community. They use the term communio, and practice it by living in open dialogue and consultation individually and collectively with the local community. Being canons regular the Norbertines combine community activity with the contemplative life. Yet unlike monks who live in cloistered, contemplative life and sometimes engage in the community, Daylesford canons regular preach, teach, and administer the sacraments for all who participate when at the Abbey. Entrance to Daylseford Abbey complex. 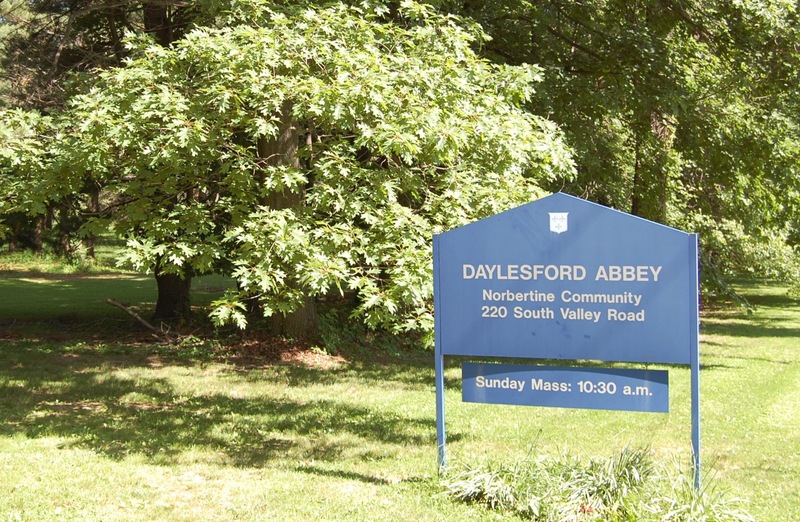 The Daylesford Abbey Spirituality Center brings diverse and innovative programs, from world renowned national speakers like Fr. Richard Rohr. Smaller programs like how to write a collect for the opening prayer of a Mass. Of course the collect written won’t get into the Roman Missal, but understanding the process is fascinating. For some of the larger programs, like conferences and retreats, the Abbey offers 36 rooms for overnight guests with home cooked meals. Dinners before spirituality programs are a nice addition to the Abbey culture. The Daylesford Abbey nave with the pews arranged in the foreground facing each other. There are several Norbertine Abbeys in the US. 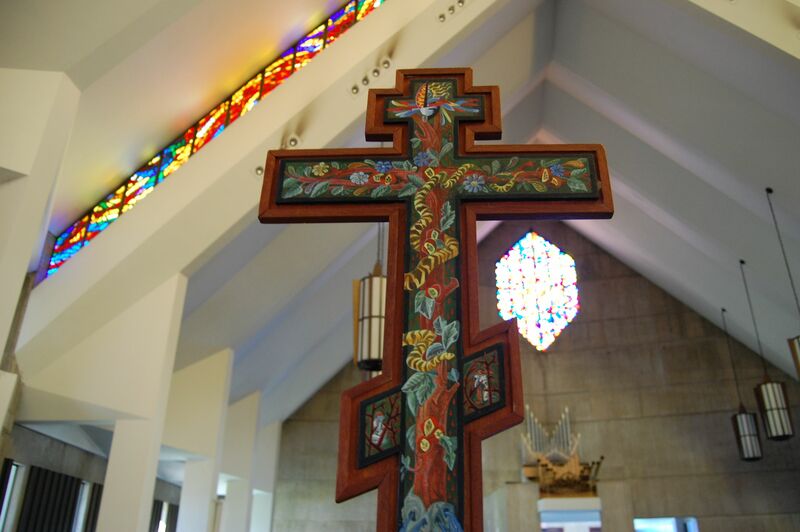 In addition to Daylesford Abbey, there is St. Norbert Abbey in De Pere Wisconsin and St. Michaels Abbey in California. Each Abbey operates autonomous of one another, with their own unique culture. The Daylesford Abbey would be considered left and liberal of other Norbertine Abbeys. This also differentiates the forward thinking Daylesford Abbey from other religious in the Philadelphia area. Since Norbert left no writings except for one small prayer, his legacy is the religious community he left behind. Following St. Augustine “those who sing pray twice” the Norbertines sing their prayers in the Divine Office and have a special devotion to the Holy Eucharist. 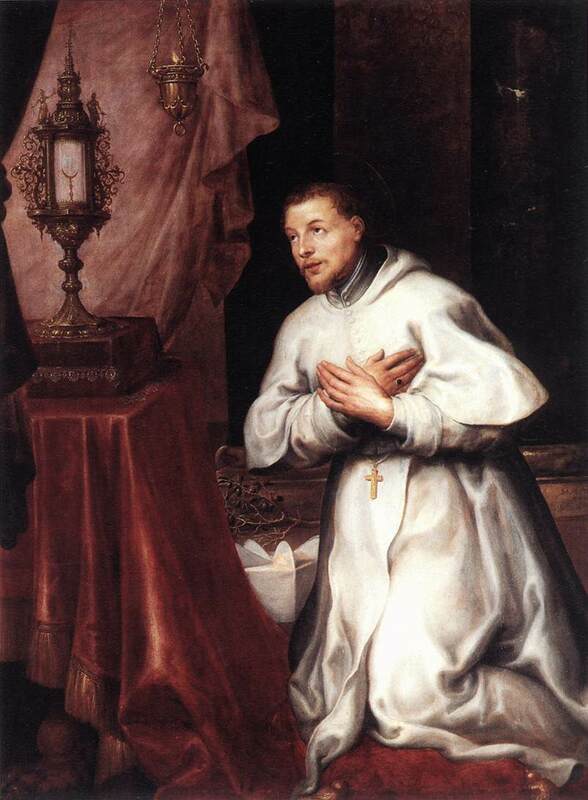 Norbert was devoted to the Holy Eucharist and defended the sanctity of the Blessed Sacrament. 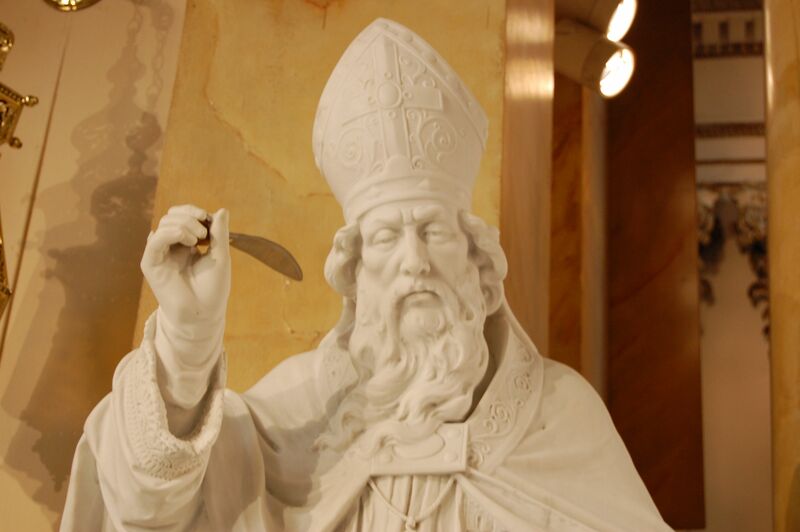 He is credited for driving a heretic from Antwerp who repeatedly blasphemed the Blessed Sacrament and had it removed from the cathedral and hidden. As part of this miracle Saint Norbert rescued the monstrance, returning it unharmed to the cathedral. 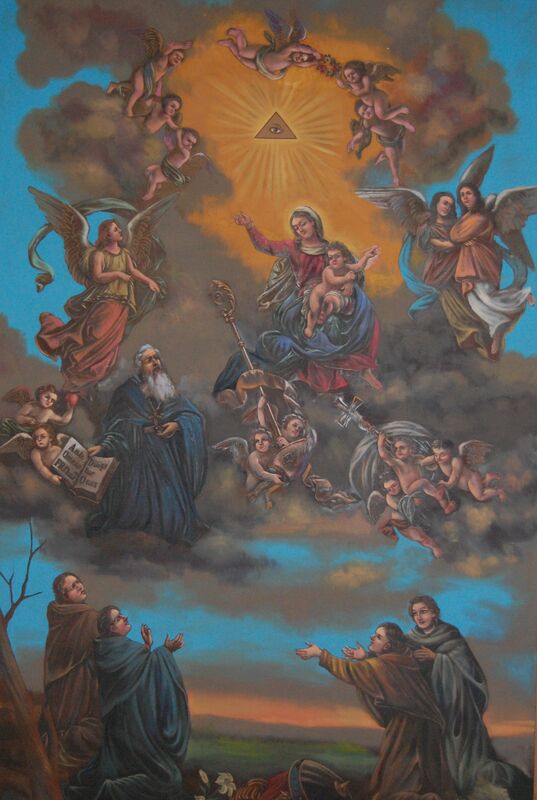 We typically see the Monstrance being held by Norbert in paintings of the saint. 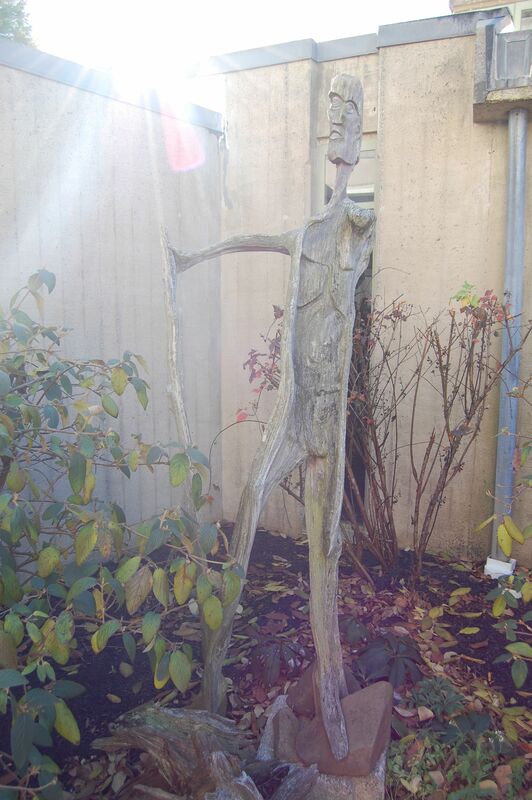 Artwork in one of the several courtyards throughout the Abbey. 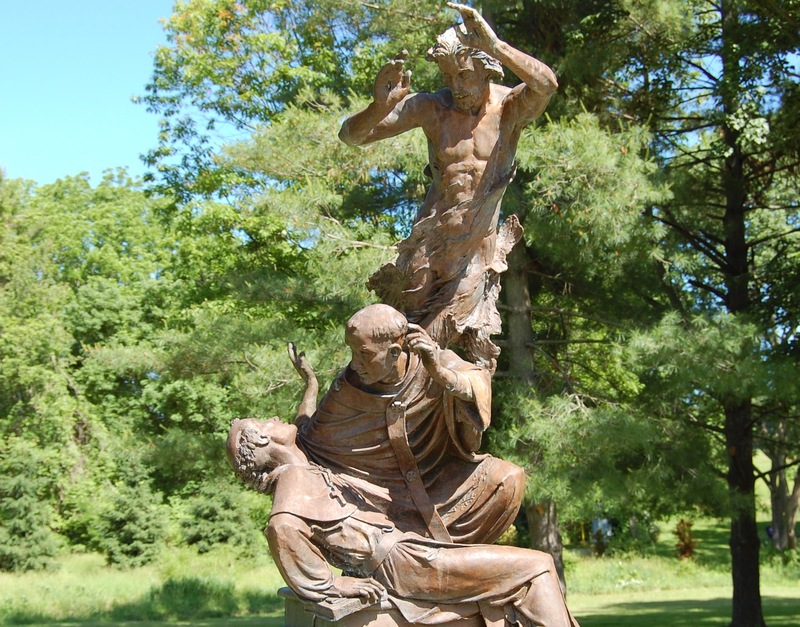 The newest edition to the Abbey grounds in Paoli, Pennsylvania is the amazing Daylesford Abbey Stations of the Cross or the Via Crucis. It’s all outdoor along a trail, and each station is an alcove off the main trail. 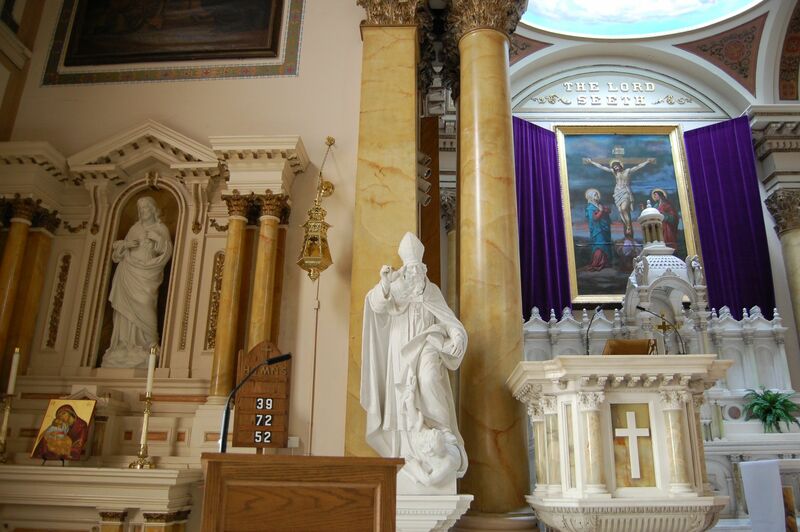 The Station scenes are replicas from the Basilica of San Zeno in Verona, Italy. Goodbye to Norbert and the Abbey on Norbert’s feast day. It’s a special place for prayer, meditation and learning. A Bishop and Doctor of the Church, St. Augustine continues to wield influence. St. Augustine R.C. 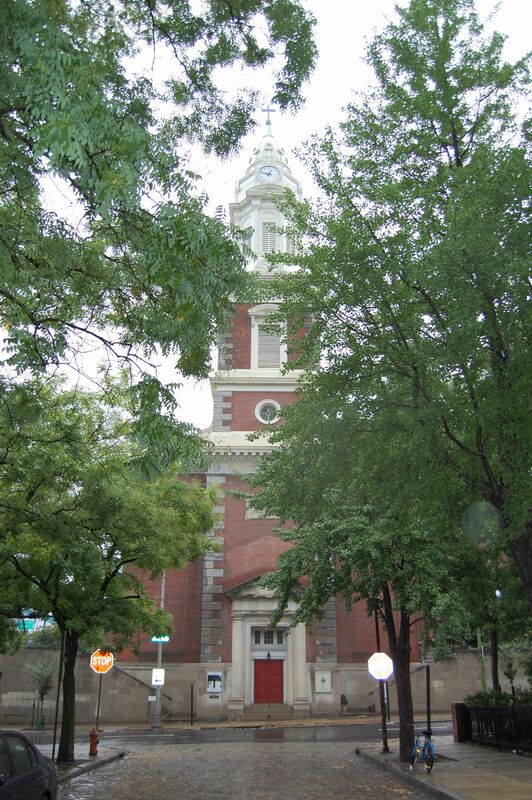 Church is a historic shrine in downtown Philadelphia Pennsylvania. 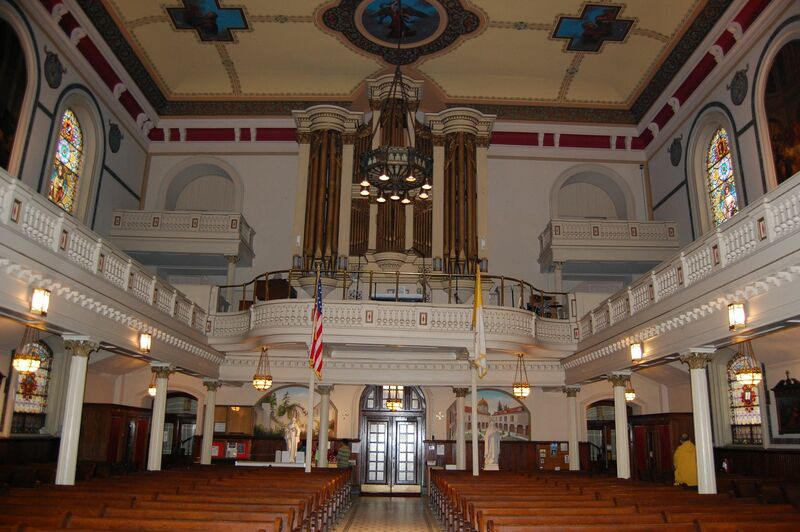 It was established in 1796 by the Irish Friars of the Order of St. Augustine and is the fourth oldest church in Philadelphia. 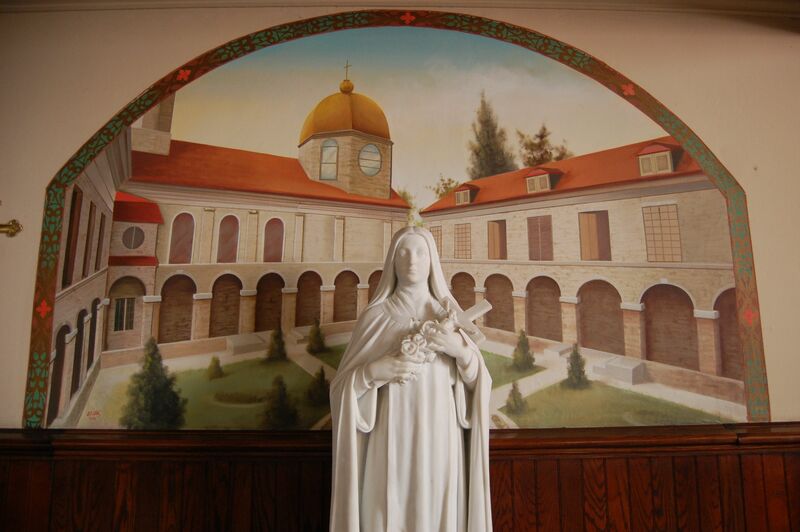 The Augustine Academy founded in 1811 became Villanova University, the oldest Catholic school in Pennsylvania. 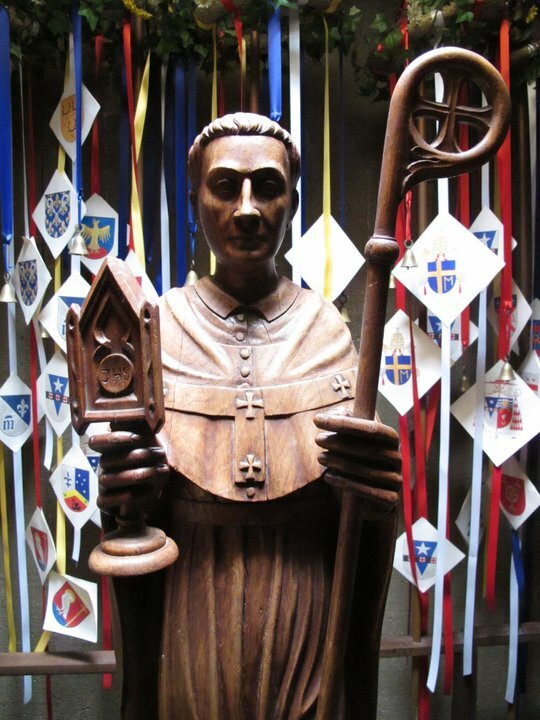 Thomas of Villanova, an Augustinian in the entrance to St. Augustine Church. 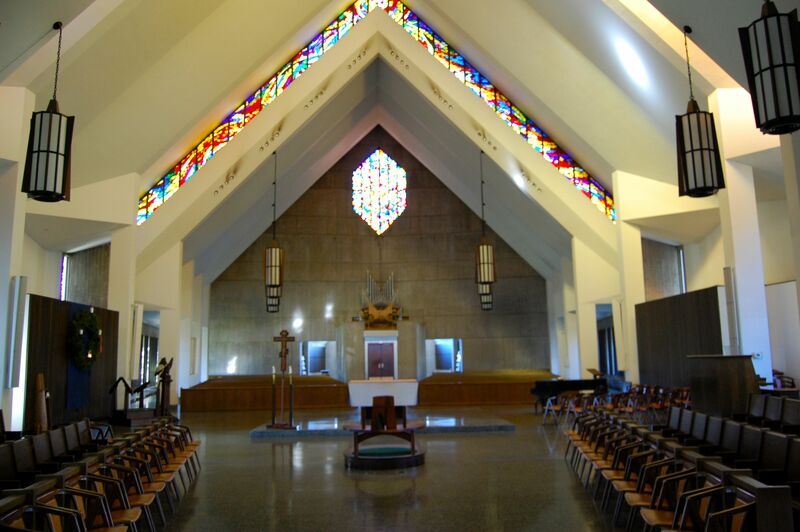 Villanova University is currently staffed by and operated by Augustinians. It has been said that Augustine wrote over 100 books and 5,000,000,000 words, inspiring many theologians of his time and our time. He is one of the four Great Fathers of the Latin Church. Entrance Antiphon Cf. Sirach 15:5 Mass at St. Augustine Feast Day, Aug 28, 2013. 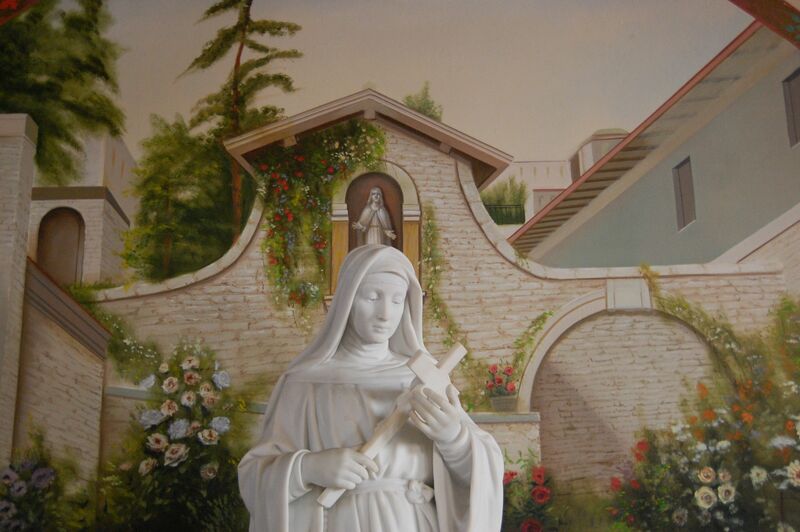 St. Rita of Cascia, an Augustinian nun, in the back of St. Augustine Church. 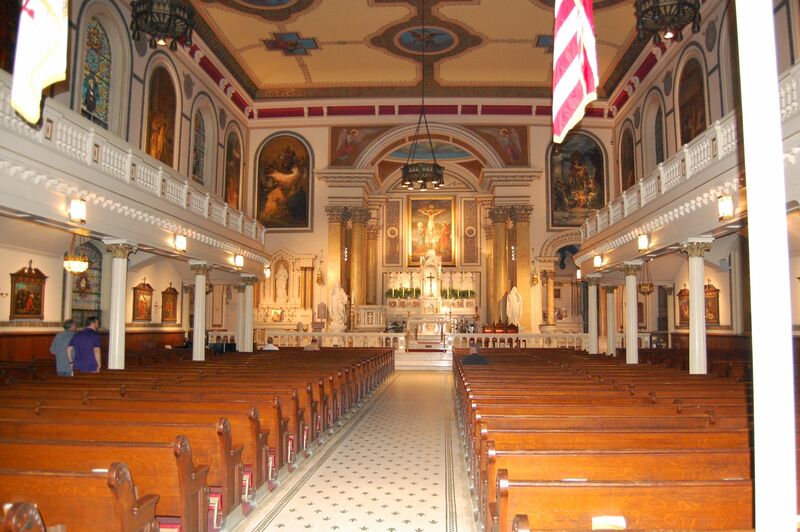 The National Shrine of St. Rita of Cascia is nearby and is one of the five official shrines in the Archdiocese of Philadelphia. Teresa of Avila, taught by Augustinian nuns, also at St. Augustine Church.